Up to 12 months battery life! The perfect gift, finder integrates all your analogue belongings into your digital lifestyle, saving you hours of trouble looking for anything and everything: Your keys, wallet, remote, phone, or tablet—finder is easily attached to anything that’s important to you in a matter of seconds with the included adhesive tape or tether. finder is just a fraction of the cost of your typical key finder. Simply download the free iTrack Easy app for Android or iOS and you’re set. It’s just finder, no subscriptions, no hidden costs. Regular quality checks and the latest technology guarantee durability and an excellent range of up to 50 m (165 ft) outdoors. Just check the app and know if your valuables are near. The app will notify you immediately if your phone loses track of a connected item (user-configurable). It’s as easy as it is ingenious. The battery is user-replaceable (up to 12 months battery life). finder doubles as a remote release for your camera app. ✅ We’ve been working hard to make our popular finder better than ever. The result: 3x louder beep—clearly audible even through walls. Improved range indoors. Up to 12 months of battery life. Smaller size: 3.6 cm x 3.6 cm x 0.5 cm! 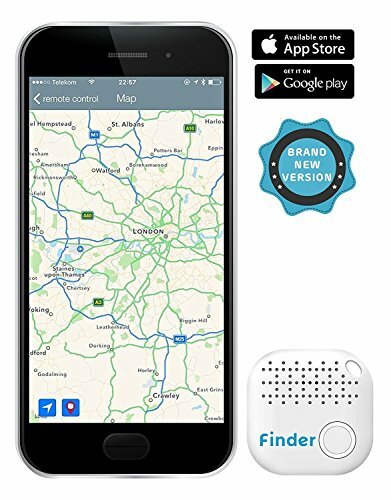 ✅ Easy to use: Simply attach finder to your valuables, tap ‘search’ in the app, and follow the beep to your keys or other items hiding away in drawers, under sofas, etc. ✅ Don’t panic: If you’ve misplaced your smartphone, you can find it just as easily. Just press finder for four seconds and your smartphone will make itself heard—even if it’s in silent mode. ✅ Reclaim your time and peace of mind: Find your connected valuables with a range of up to 50 m (165 ft) even through walls using a free app for your Android or iOS device. ✅ The perfect gift: We all have that one friend who can never seem to find anything. Now you can make their life that much easier. Or yours. finder puts an end to the annoying search for your keys, wallet, smartphone, remote, tablet, or purse. It’s the innovative and highly efficient way to find anything and everything in a matter of seconds. If you have any questions about this product by musegear, contact us by completing and submitting the form below. If you are looking for a specif part number, please include it with your message.